Cap Malheureux is a small fishing village located in the region of Riviere du Rempart District on the northernmost tip of Mauritius. Cap Malheureux has a population of approximately 4,803 people. Cap Malheureux offers breathtaking views of some small islands off the coast, such as Flat Island famous for its lighthouse, Gunner’s Coin, Gabriel Island and Round Island where you can see a wildlife bird sanctuary with its harmless boas and indigenous lizards. The economy of this magnificent place depends significantly on its tourism industry; however, fishing is the most important occupational activity. Cap Malheureux is a place of great historical importance for Mauritius. You can see enormous rocks on Cap Malheureux beach where the British force landed and took possession of Mauritius from French. The English secretly took over Mauritius on September 2, 1810 after a long battle. In 1968, when Mauritius gained its independence, the island was bound to the Mauritian territory. Cap Malheureux means cape of misfortune, though where this name came from is not sure. There are many legends and interpretations to the history of the name. 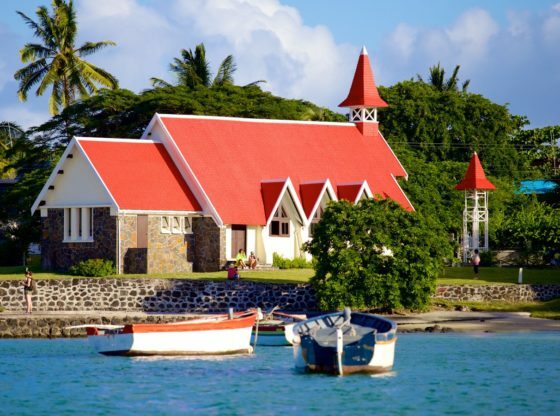 The main attraction of the village is the church with the red roof which stands on the north coast, facing the lagoon. This church was built in memory of the shipwrecks which happened there in the past where the ships used to stop for bad weather and break into rocks. Whenever you visit this place don’t forget to visit this beautiful church with white walls, visible framework and a carved stone altar. Cap Malheureux is the perfect destination for windsurfing/ kiteboarding lovers. The best months to go there for windsurfing are June, July, August, September and October in which the wind blows at the speed of 15 and 25 knots. The wind speed becomes low from December to April. Cap Malheureux is a great place for wave and freestyle riding as well. You get flat, chopped and waved water and the water conditions are suitable for all level riders from beginners to professionals. You can enjoy other activities like sailing and boarding. Exclusive boat trips are also available which can be organized by the tour operators around the north coast. If you are a fan of the Indian food, then you must visit the Nirvana North Indian Restaurant which boasts the best Indian food in Mauritius. Cap Malheureux has a lot of beautiful beach villas which are available for renting. You can either opt for them or go for some hotels and resorts such as Coin De Mare hotel.